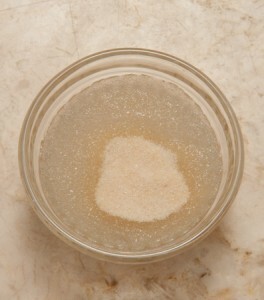 Soften the gelatin in the water and set aside. 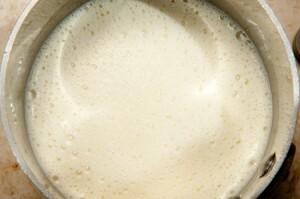 Heat the milk until hot but not boiling. 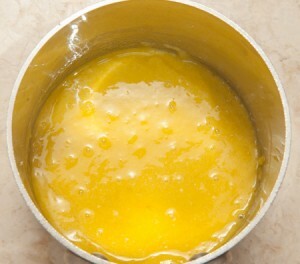 Whisk the egg yolks and sugar together in a non-reactive saucepan. 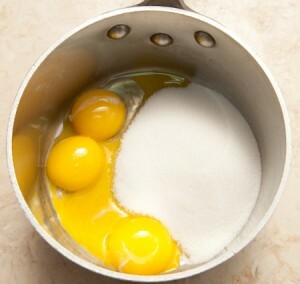 Add the milk slowly, whisking well and scraping the corners of pan with a rubber spatula to make sure all of the egg yolk mixture is incorporated. Place over medium heat and, stirring constantly, bring to a boil. Boil for 1 minute, stirring constantly. 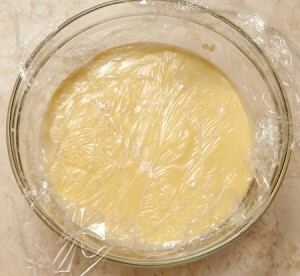 Remove from the heat and add the vanilla (if using extract). 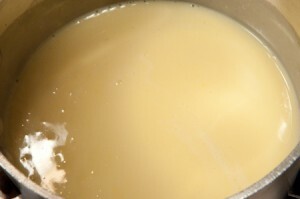 Tear the gelatin into small pieces and stir it into the hot liquid (there is no need to liquefy it, the heat of the mixture will do this for you). cover the surface with plastic wrap, poke a few holes in it and refrigerate overnight to chill or freeze. 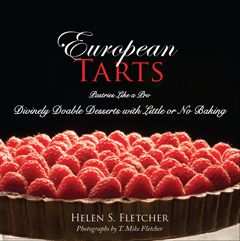 This entry was posted in Front Page and tagged filling, pastry, pastry cream on August 5, 2012 by hfletcher. I never used pastry cream as a filling as I thought it too unstable. It can also be dangerous to hold at room temperature in heat. 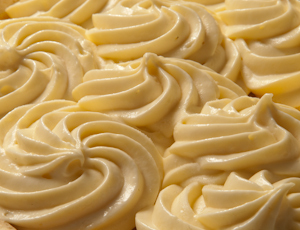 Pastry cream needs to be refrigerated. You will find a lot of information on my main website, http://www.pastrieslikeapro.com. My suggestion would be to make an appointment with one or more people supplying wedding cakes in your area to see what they are doing. As professionals, they will know what will hold and what won’t. Get your ideas from them and then you will have a better feel for what will work for you. Good luck. Hi Helen, I am a bloke who likes to dabble in recipes, This sounds good to me, but I need to know what sort of flour is used. I have looked at other sites and it appears it is plain flour used, is this correct? Hi Allan – Sorry to confuse you. It is indeed all purpose flour. 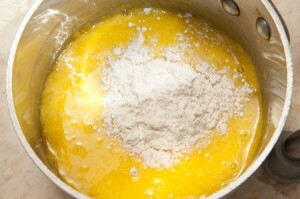 Bread flour will also work, but pastry flour or cake flours are too weak. Hope this helps. 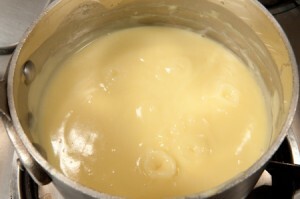 Hi Helen, I followed your whole recipe and used the cream also. I made horns from Puff Pastry and filled them with the pastry cream. I froze them in airtight container overnight. They were laying down, so a bit worried the cream would run out. But everything OK. The next day I defrosted 2 cones, my wife had one first and she loved it. I tried one a bit later and also found it to be great. This is now on my “To Do” list. Thanks for letting me know. I very much appreciate your success and your comment. You absolutely can. 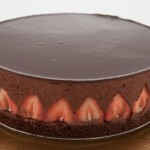 You might want to brush the layers of your cake with a liqueur syrup to infuse more flavor into the cake. Because the addition of a great deal of lemon juice will curdle the milk, I have never used the juice. 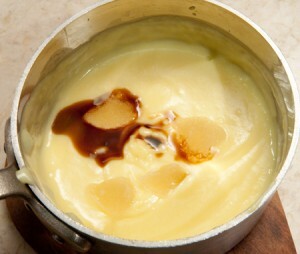 Certainly you can use as much lemon rind as you wish but it will alter the smooth consistency of the pastry cream. 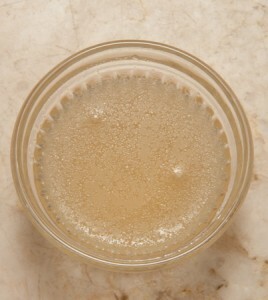 I did find a recipe on the internet that uses fresh lemon juice if you wish to try it. 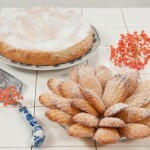 Go to http://www.foodnetwork.com/recipes/emeril-lagasse/fresh-lemon-pastry-cream-recipe.html. Hi Helen, thanks for the recipe! 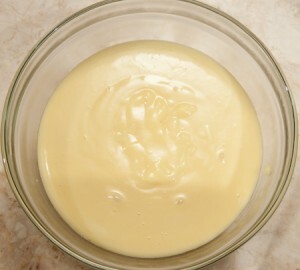 I was wondering if I can replace the granulated sugar with brown sugar or cane sugar as I am trying out some new flavour combinations for my macarons and the addition of gelatin into this particular pastry cream seems like it will hold well as a filling. Many thanks! Varying the sugar is not a problem, but I wouldn’t use this as a filling for macarons as the pastry cream should be kept refrigerated. It is also too moist a filling for macaron. Varying the sugar is not a problem, but I wouldn’t use this as a filling for macarons as it should be kept refrigerated. It is also too moist a filling for macaron. How would I make a chocolate pastry cream with you recip? 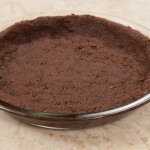 Add 3 ounces of melted semisweet chocolate to the pastry cream at the end with the vanilla. How long can this be kept in fridge? Since you mentioned it could be frozen, how long and what process to thaw it, in fridge or counter and reship? Five days is the most I would keep this refrigerated. As to thawing, since it has to be kept refrigerated, put it in the refrigerator a day before you want to use it. Hi, can I use this in a danish pastry (without the whipped cream) and bake or do I need another recipe? Hi Lauren: I have never used this i baking but it should be fine if you omit the whipped cream.